This forum is really cool because there are alot of like-minded people who are really interested in comparing climates for different locations. 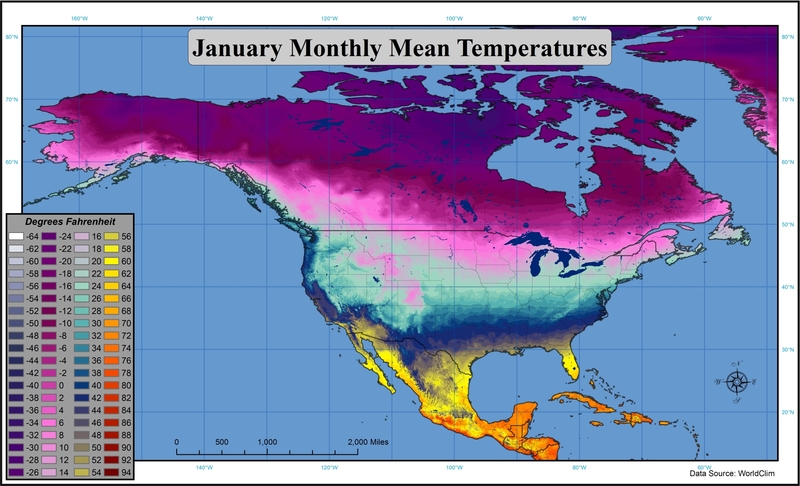 I like to map things I'm interested in so I created this pair of maps showing North America and Asia and their respective average temperatures for January. 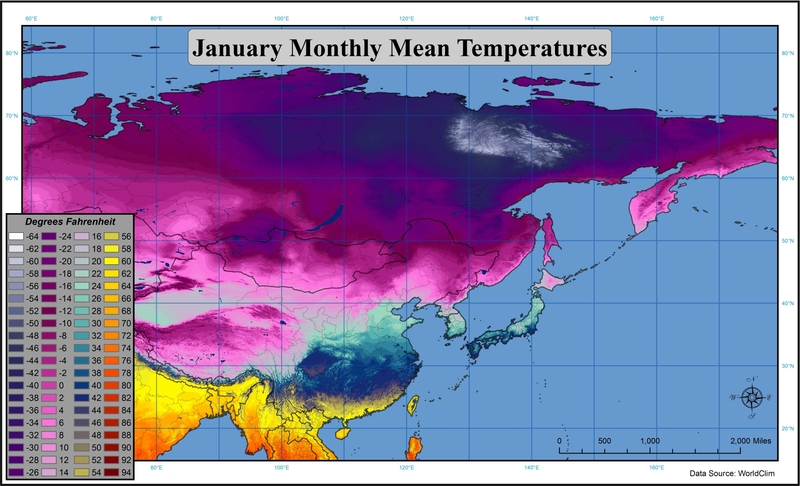 It's interesting seeing how insanely cold Siberia and East Asia really gets. No idea how people survive those winters. I don't want to sound rude, but humans have beaten diseases, famine, 2 world wars and so on. Walked across continents, sailed across the oceans in small ships and survived in jungles and on isolated islands. Whatever nature has threwn at humans, we've always have survived. I don't think surviving -20C winters is that tough. The biggest cities in Siberia, like Irkutsk, Krasnoyarsk and Novosibirsk have winters comparable to Winnipeg or Saskatoon. No biggie. Even in Omyakon people just cope with the cold. cool stuff. the colouration feels a bit illogical, though. very good, detailed maps. thanks for sharing them. @Ariete: well, they are indeed pretty much uninhabted, but nontheless there are still big cities like Yakutsk situated in that extremely cold area. Siberia is far colder than winnipeg though. In your face americans. You aren't good at everything weather related. Eh Chicagogeorge? That's very impressive what are some areas in the white area? Do they have -60c highs? I personally could not cope with that. where's the colder spots from? Don't know. It's the Verkhoyansk Ridge with mountains and overall higher elevation. I don't think there's any permanent settlements (or weather stations) between Yakutsk and Tiksi. Look at this relief map. There's not even a road between Yakutsk and Tiksi, but only traversable in summer with boat along the Lena river or by air. The road between Yakutsk and Magadan is apparently not even paved. So this area is really really desolate. Siberia is a huge region. Some parts are colder (which, as has been mentioned, are very sparsely populated). Some parts are comparable or even warmer. Another thing is that for the same latitude, places in Siberia well away from the Arctic and Pacific coasts have warmer summers (a little shorter though) than in North America.